BONUS ALLRED! BONUS BATMAN ’66! Home » BATMAN'S HOT-LINE » BONUS ALLRED! BONUS BATMAN ’66! Mike Allred’s our guest this month, giving EXCLUSIVE commentary on all his Batman ’66-themed variant covers. 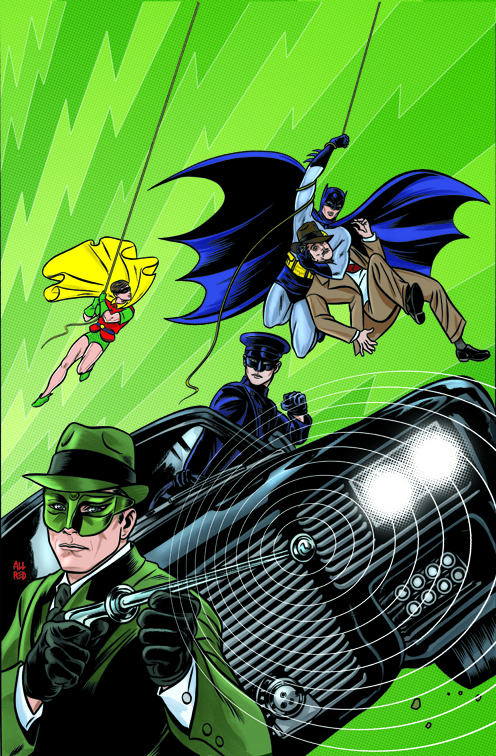 But just today DC released this special Allred variant for Issue #1 of Batman ’66 Meets the Green Hornet! The first digital chapter will be available May 21, while the first print issue hits stands June 4. A Detective Comics #27/Batman #1/Batman ’66/Green Hornet mashup!